Shuttle clutched the lime light for some time with the announcement of their first AMD640 based motherboard, the HOT-603, however stability problems among other things degraded the overall value of the motherboard. Since the release of the HOT-603 Shuttle has continued to crank out motherboards based on Intel's LX and TX chipsets, however until now we have yet to see any more entries using non-Intel chipsets. 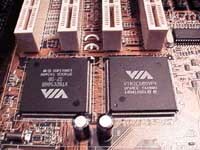 Although the name isn't as flashy, the VIA VPX/97 chipset is basically the same thing the AMD640 chipset was, the only difference being official support for the 75MHz bus speed. Using this official support to their advertising advantage, Shuttle claims that their new HOT-579 is "an over-clocker's best love!" How accurate is Shuttle's claim? Let's find out shall we? With a footprint smaller than a sheet of paper it is obvious that the HOT-579 isn't an ATX motherboard, however the HOT-579 does feature both AT and ATX Power Supply connectors for those of you addicted to the ATX style of cases. Unlike some combo AT/ATX motherboards, the HOT-579 doesn't control its power supply source in the BIOS Setup, a very stupid decision on a manufacturer's part in the first place (how do they expect you to enter the BIOS setup if you can't power up the motherboard? ), instead by setting a single jumper on the motherboard you can switch between an AT or an ATX power source. When setting up the HOT-579 be sure that this setting is configured properly, as it could lead to quite a few problems down the road while you're building/upgrading your system. This jumper setting, along with the other settings necessary to get your system up and running are all documented (including the overclocked bus speed settings) in Shuttle's HOT-579 Installations Guide, basically a quick reference manual with all the filler junk cut out of it. The rest of the user's manual, in addition to other neat additions such as BIOS files, drivers, etc... are included on the CD-ROM packaged with all Shuttle motherboards. For an AT motherboard the layout of the HOT-579 is outstanding. Not only did Shuttle manage to fit 4 PCI and 3 ISA slots onto a baby AT board a little wider than a standard sheet of college ruled paper, but they also ensured that ALL 3 ISA slots would accept full length cards. In doing this they did overlook the fact that only 2 of the PCI slots can be populated by full length cards, but the popularity of full length ISA cards seems to be much greater than full length PCI cards with users that would be interested in the HOT-579. Like most Shuttle motherboards the HOT-579 features an AWARD PnP BIOS Setup, unfortunately in the Chipset Features Setup you can do a little more than change the colors on the screen. Its a bit more comprehensive than that, however full control over EDO/SDRAM timings is one thing that the HOT-579 seems to lack, not that you'll really need it though since the motherboard didn't seem to have any problem running at the 75/83MHz bus speeds with the Advanced Megatrends SDRAM used in the tests. The stability of the HOT-579 is much greater than one would expect from simply looking at the motherboard, the HOT-579 managed to allow the test K6 system (using one of the first K6/233's which were very un-overclockable) to be taken up to 250MHz (83.3 x 3.0) using a 3.4v core setting and the fastest memory timings in the BIOS possible for the setup. The Cyrix 6x86MX-PR2/200+ that was used in the tests even made it up to a PR2/233+ setting (a very difficult feat to accomplish if you have one of the older 6x86MX chips) however the test system wasn't stable enough to complete a full run of Winstone 97/98. When installing the HOT-579, particularly the Socket-7 Heatsink/Fan you should be very careful. 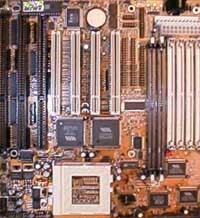 The sole toroid on the motherboard is very flimsy, and happens to be positioned by the Socket-7 Heatsink attachment notch in addition to being surrounded by the majority of the capacitors on the motherboard (if you're wondering what in the world a toroid is, take a look at the picture to the right, it is the little green donut shaped object with wire coiled around it). 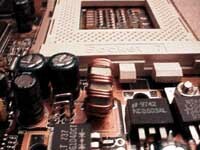 When installing the Heatsink/Fan be careful not to accidentally damage the toroid or the capacitors around the CPU Socket. Another flaw in the layout of the HOT-579 is the placement of the Bus speed jumpers, they are placed in a corner generated by the meeting of the last DIMM slot and the first SIMM slot. Changing the settings on any of these three jumpers is a pain without the aid of a pair of trust needle nose pliers, just keep that in mind if you do decide to pick up a 579. While the HOT-579 was very stable with the AMD K6 during the tests, it seemed to absolutely hate the Pentium MMX. At 233MHz there were no problems at all keeping the Pentium MMX running cool and stable, at 250MHz the system was overall, very stable, however pushing the system past 250MHz forced me to take the core voltage past 3.0v as well as tweak the BIOS timings a bit. It became quite obvious that the HOT-579 wasn't really intended to be a great Pentium MMX board although it is a fair performer with the chip, my suggestion would be for AMD owners to give the HOT-579 a try, and for Intel owners to shift their attention to some of Shuttle's other excellent designs.